I have just launched a page on my website where I will be featuring your child’s story! This will help parents with concerns and the parents of newly diagnosed children. I believe that being aware of the early signs is key! Help me spread the word by sharing your story. *If you have a blog or website of your own, please include that so I can put that in your story. 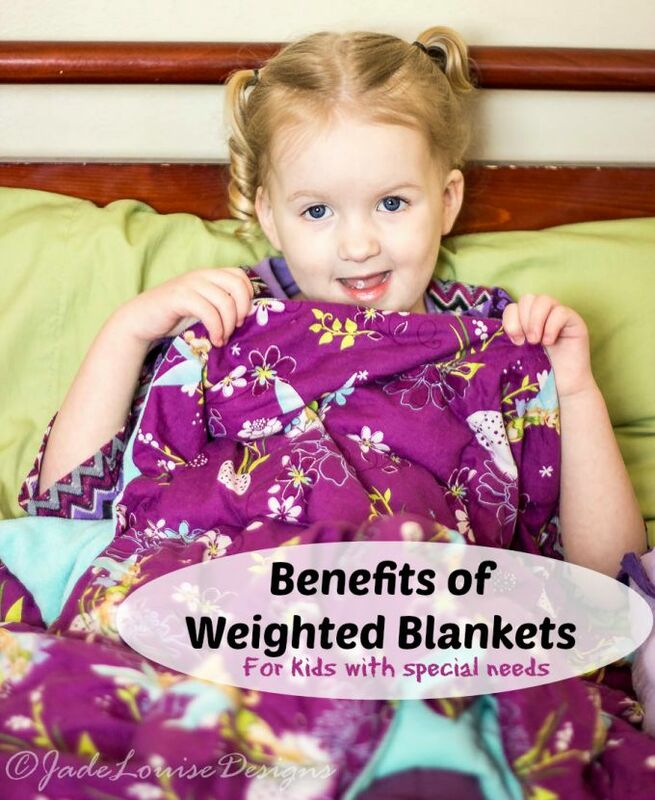 Do your children use weighted blankets? How do they like them? Oliver had a tantrum filled afternoon, so a “check out” was in order. 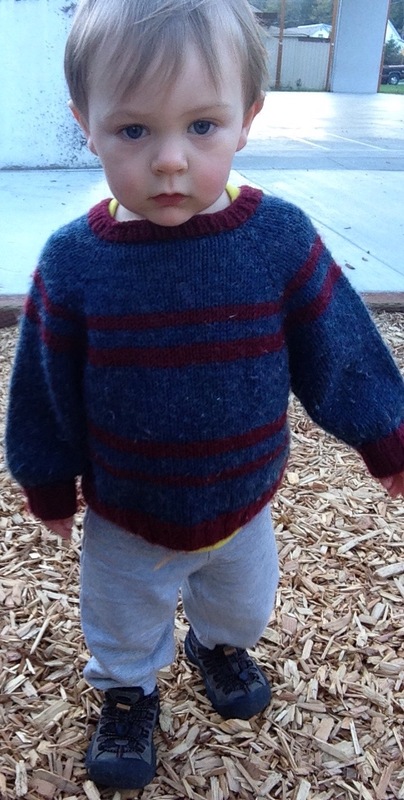 To the playground with us. Feel free to look them over and offer your thoughts and feedback! I also just started a new page that is titled ‘Other Parents’ Stories’. Visit this page to read more. I’d love to feature your story on this page! I was so fortunate to have a friend with a child on the autism spectrum point out to me that the Udi’s bread that Oliver was eating held ingredients that he was allergic to in it, which I somehow missed when ingredient glancing at the grocery store. 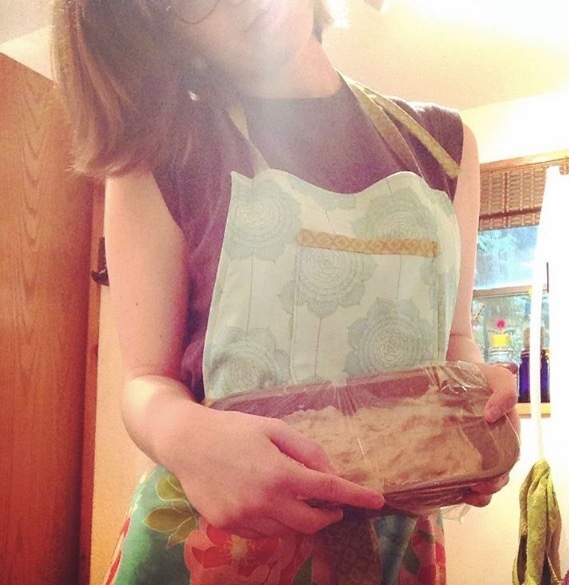 She makes her son’s bread and gave me this delicious recipe that even my picky little eater enjoys. 1. Mix yeast & sugar in bowl, add warm water, let proof 10 minutes or so. 3. Add vinegar & oil. 4. Add proofed yeast and thoroughly mix in mixer or by hand (no kneading). 5. Spoon into a loaf pan, cover with plastic wrap, set aside to rise for 1 hour. 6. Preheat oven to 350. 7. Bake for 53 minutes, let cool a few minutes before removing from pan to a wire wrack. 8. After cooled, store in plastic bag. One day on counter is OK, then refrigerate. ** Comment to let everyone know how your bread turns out! Today, at our final appointment at the autism center, Oliver received a diagnosis of Autism Spectrum Disorder. Today marked our first major step towards healing and, while I hold a heavy heart and am experiencing some fear in what our future will look like, I am trying my best to channel all of my negative thoughts into a place of love and hopefulness. Do Your Children Do This? Do any of your children cover or plug their ears? Oliver will do this when there are loud noises, sometimes when the TV is on, and sometimes when it is silent (or seemingly silent, from my neurotypical perspective). When do your children do this? 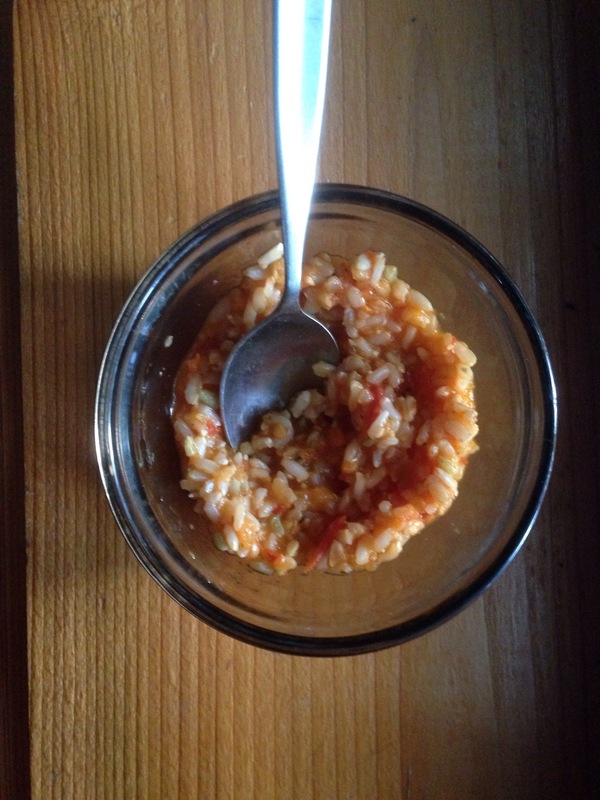 Oliver’s yummy organic brown rice with homemade/homegrown tomato sauce mixed in. His #1 new favorite dish. Two days ago was Oliver’s first home visit from his early intervention center’s Special Educator. She drove about an hour and a half out to us and spent another hour and a half with him. She got to know how Oliver and I interact and then offered suggestions. For example, she noticed that he gets distracted, overstimulated, and frustrated easily, so she wanted to see if he could be more calm in his tunnel toy that attaches to a tent. He went in there and laid down and we were able to play peekaboo with his full attention. She talked about how social games like peek-a-boo, tickle games, and singing songs with hand motions/simple dances can improve his social issues and his language development at the same time (getting him to better connect with me is a plus, too). We also spent time doing something that I had read about in Raun Kaufman’s Autism Breakthrough– we entered Oliver’s world through imitation. We set a timer for 3 minutes where we mirrored everything he did. We colored similar patterns, dropped crayons over and over, danced, hopped, flapped our hands, and stood up/sat down countless times. He picked up on this new “game” rather quickly and smiled with anticipation while he thought of something else he could have us copy. This really engaged him and his eye contact was strong when we were doing this. After the timer went off, we tried to invite him “into our world” by asking him to copy what we did. This didn’t work out for us because he finds change challenging, but she saw real promise in him. He lit up in a way that I had never seen before– I can not recommend entering your child’s world enough. Give it a try! If you’ve done this, comment how it went for you. Today was the second of four appointments and, within those, was the first of two evaluations. Last week was the first appointment which was exclusively questions about Oliver, this appointment (and next week’s appointment) was the evaluation portion, and the final appointment is the diagnosis and next step discussion. As I’ve said before, I will be posting after each one to give other parents an idea of what to expect. We arrived and were shortly thereafter called back by the doctor. We followed her to the room where we had also been for the first appointment. She gave him the option of two toys to see if he’s shows preferences, offered him kitchen utensils and toys that require pretend play, and other developmental tests through toys and play. She asked me many more questions then had me try and get his attention while he was engaged in his own play; I couldn’t get him to look up. Then, as he played alone in the corner, she said that she was going to lightly blow a whistle. She said that a “normal” response would be for him to turn his head to see the noise. 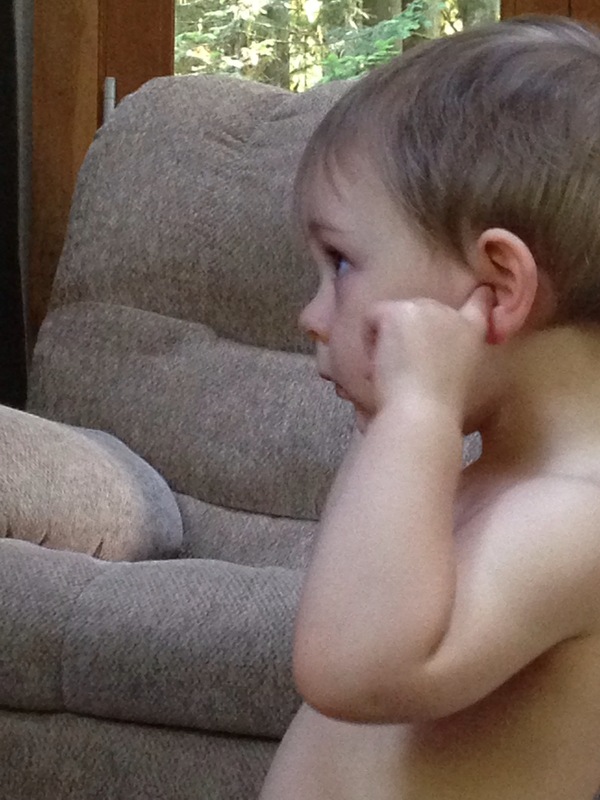 I told her that he does not like loud noises, but gave her the okay to see his reaction for herself. She proceeded by blowing into the whistle and, as I sat by his side, I watch him lift his head from his play, stare blankly into the corner he faced, then cover his eyes as tears welled up and his chin erupted into an immensely sad, pouted lip. He covered his eyes, then covered his ears as he screamed. After a few minutes of this, he buried his face into my lap as his screams transformed into more of a hyperventilation. I rubbed his back, talked to him, shhh’d him in attempt to calm him. Giving him a bottle of coconut water and a toy aided him back to contentedness but it took around 30 minutes to get him smiling again. She tried to see if he would sit in a chair at the table, but he can’t sit still for the life of him, so sitting him in a chair set him off again. She asked a few more questions and then we closed the meeting and went on with our day. She said that next time a doctoral student will be joining us, and his session will be video taped in a new room. She told me that I will be with him most of the time, but I may be asked to leave the room to see how he does with me leaving briefly. I’ll post again after next week’s appointment. Have any of my followers gone through a diagnostic evaluation process– if so, did your appointments look like ours? Comment any similarities or differences to give other parents an idea of what to expect.